Over the past few years, McMaster University Library has run some great Freedom to Read (F2R) Week campaigns that have focused on banned and challenged books. This year, I was tasked with creating a campaign that focused less on books and more on academia and intellectual freedom. Although these are exciting topics for me, I thought that students might find these topics a little boring. So, what to do? I knew from the beginning that I wanted the campaign to be run on social media, and to consist of a few short, attention-grabbing videos. I also wanted the videos to demonstrate that intellectual freedom protects our capacity to explore new ways of thinking and our ability to challenge one another. Then it dawned on me that perhaps the best way to illustrate the importance of intellectual freedom is to demonstrate what happened to scholars in the past when they were not protected by these principles. In order to bring this topic into a modern context, I used social media as a framing device: what might happen to these scholars if they were sharing their radical ideas on social media platforms. I consulted with various people and departments within the University to ensure the successful creation and dissemination of the videos. I worked with McMaster Library’s Archives and Rare Books Librarian, Myron Groover, to brainstorm which scholars to feature and the Manager of Student Media & Computing, Chris McAllister, to help me work out “kinks” in the execution of the videos. I also had regular communication with both the library advancement committee and the University’s public relations department to ensure that the videos met the branding guidelines for dissemination using the University’s channels. I used TechSmith’s Camtasia to compile and edit the videos. My initial strategy was to create social media accounts for all of the people featured in the videos, and then to record their interactions using the screen cast function. Unfortunately Twitter was able to detect that I am not actually Galileo, The Roman Inquisition and the Pope… so I was blocked. As a result, I had to figure out how to use only one Twitter and Facebook account by re-creating the interface in each video frame. It took about four full workdays to create the set of three videos. The videos were created with the intention of sharing them on social media. The first video was initially shared on a library Instagram account (191 views, 52 likes), but the ending of the video needed to be trimmed to fit within Instagram’s one-minute maximum time frame. The videos were also posted on the Library’s YouTube account and were followed up with promotion on the Library’s Twitter accounts. These resulted in a about a hundred views per video… but nothing in comparison to the 4800+ views in the first five days of the videos being posted on the University’s Facebook account! To conclude F2R Week, the videos were also shared in a Library News Story. 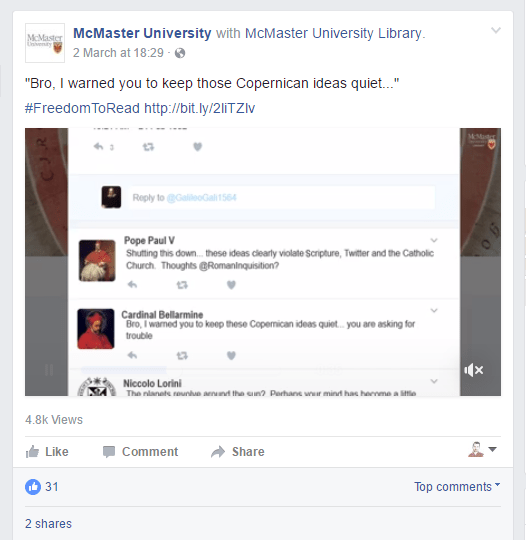 McMaster’s primary account shared one of the videos, garnering significant views. If there was a lesson that I learned from this project, it is to always remain flexible and adaptive. I usually begin a video project with a clear idea of what it will look like, and how I will go about doing it, but it rarely works out the way that I plan. Make a social media account with Galileo and his haters? Easy! That is, until I realized boiling down really complex historical events (that I didn’t know much about) into a few Tweets takes quite a lot of research and creativity. Also, I definitely did not plan to have to re-create the social media platforms in each frame of the video. But, when the day is done, the trick is to be resourceful and find a way around the roadblocks to get to the completely worth-while final result!